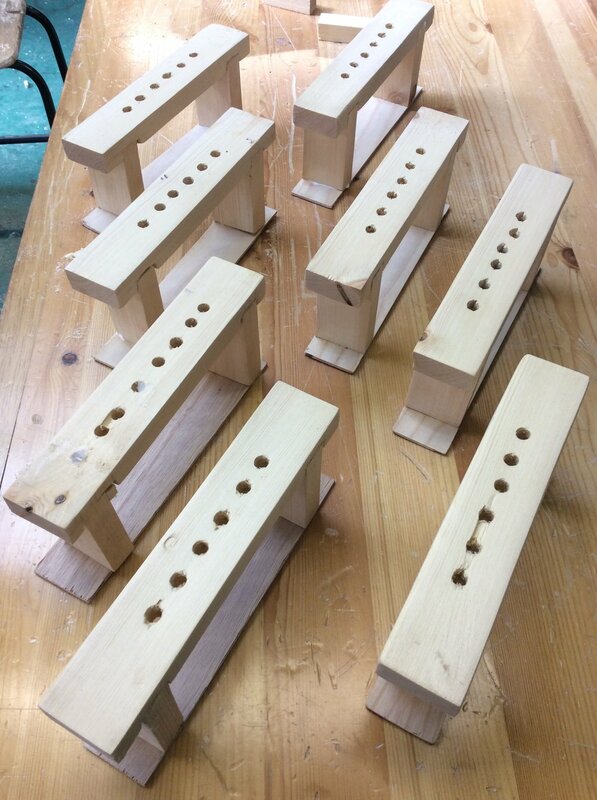 Latest News — St Aidan's C.S. 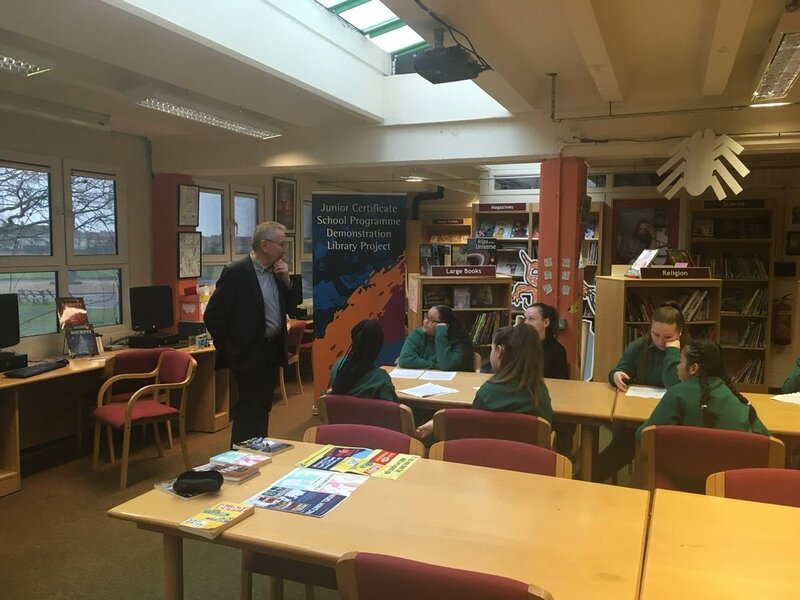 On Tuesday, 5th March the Oral Storytellers from St. Aidan’s went to the Aspect Hotel in Park West to see their entry at the Make A Book 2019 Exhibition. The storytellers worked in teams with Aideen McBride to tell the stories in their own words. Click here to listen such a critical skill to learn. When we arrived at the hotel we got a very warm welcome from the organisers. After our pictures were taken the students presented their entry to the audience. This was followed by prize giving and a wonderful Rap performance from Garry McCarthy of GMC Beats. The day was full of excitement and joy. When we had finished we had a hot lunch and put our quiz into a big box on the way out. Everyone had a great day and are grateful to Ms. Flynn for letting us get involved in the exhibition! April 8, 2019 by Martina Flynn. 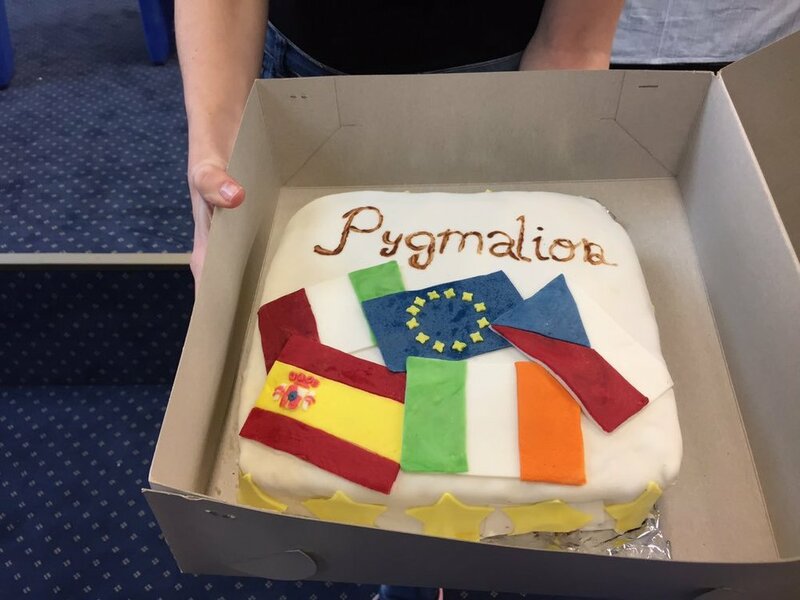 Ms Flynn invited students who took part in the Erasmus+ Eurostories Project Logo Competition and the winner of the competition in our school Sofia Da Silva with her outstanding display of artwork in her logo to welcome the Erasmus+ visitors to our school. The Italians were the overall winners of the Competition but we are still very proud of our talented student that tried her best. 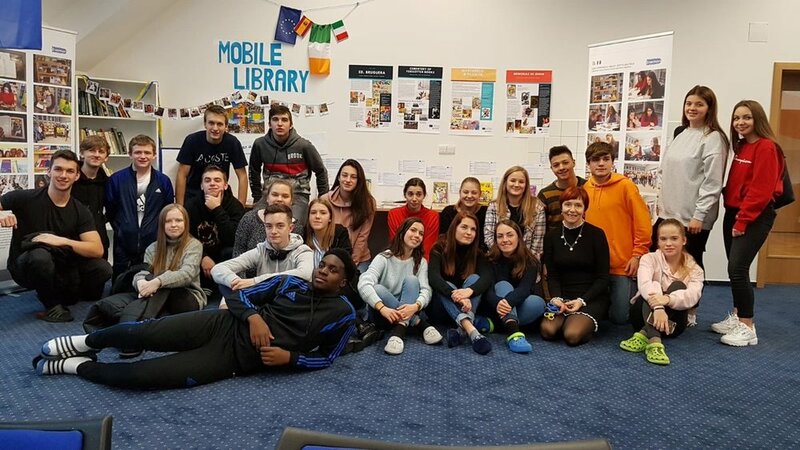 Along with Sofia and Mary Anne our artist and journalists for the day St. Aidan’s Library Assistants and the students who are taking part in the Erasmus+ Mobility’s welcomed the visitors with a warm welcome at the entrance. We greeted them with a hand shake and escorted them into the Library. In the Library we were in for a surprise when Bruno, an ex St Aidan's (SAC)S student came to talk to the visitors and tell them about our school and a bit about his college life. We were astonished about how well he was getting on and how organised his plans for the future were! We journalists inspire to be like him in the future and hope we can get into a good college too. The visitors gave Bruno a round of applause and Ms Flynn told the visitors more about our school. The visitors were from different countries, three from Spain, three from Italy, two from Czech Republic and one from a School Library not too far from here. 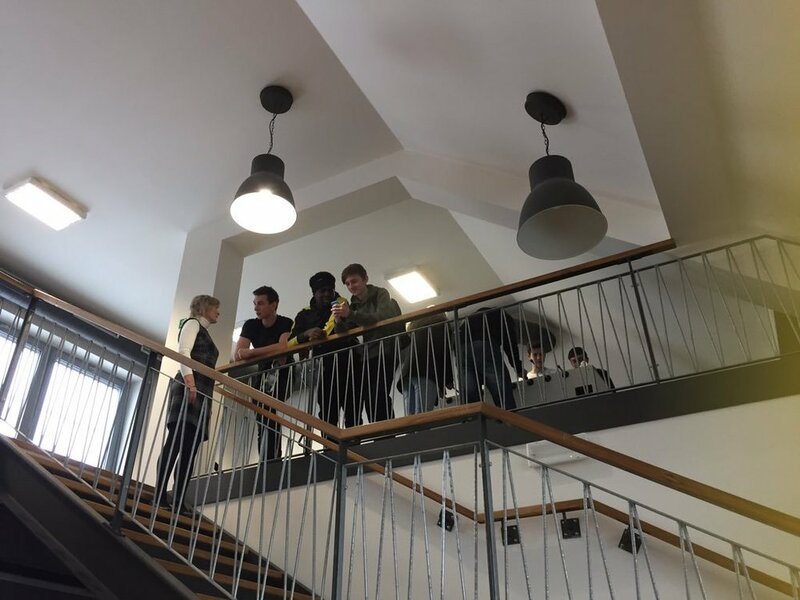 We took lots of photos while the visitors experienced some lovely singing from our 1st and 2nd years, and after that they listened to some more music from our school’s choir, Le Cheile. They sang “Blinded By Your Grace”, “This Is Me” and “Home”. Our visitors appreciated the singing and we returned to the library once again to have a small meeting between Ms Flynn and the visitors, they were given gifts by Ms Flynn’s library Assistants and helpers. Special thanks to the visitors for giving us a visit and telling us a bit about themselves and an even bigger thanks to Ms Flynn for organizing this event! April 1, 2019 by Martina Flynn. 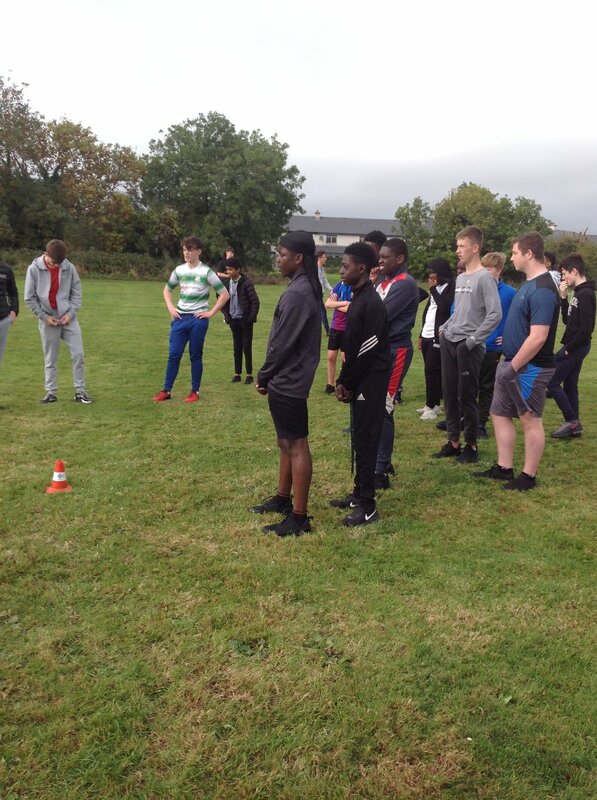 Congratulations to Mark Sogoba, Shadrak Ibidapo, Ryan Dunne, Stephen Kearney and Jessica Oigbochie who completed a Maths Sparks progamme in conjuction with UCD! November 20, 2018 by Martina Flynn. Past Pupil, Natalie, wins Scholarship in Tallaght IT! Congratulations to Natalie Thunder from last year sixth year who received the South Dublin County Council/ IT Tallaght Access Scholarship on Monday 22nd October. November 9, 2018 by Laura Sloyan. St. Aidan's and Killinarden Community School have been chosen to take part in a European Union funded project called Erasmus+. 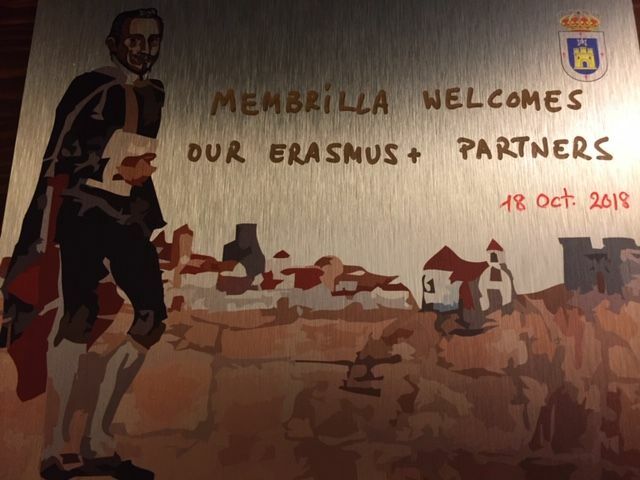 The Erasmus+ project links us with 3 other schools in Europe from Spain, Czech Republic and Italy. The title of our Erasmus+ project is 'Europe, A Heritage Made of Stories' and it will run over the next 2 years. 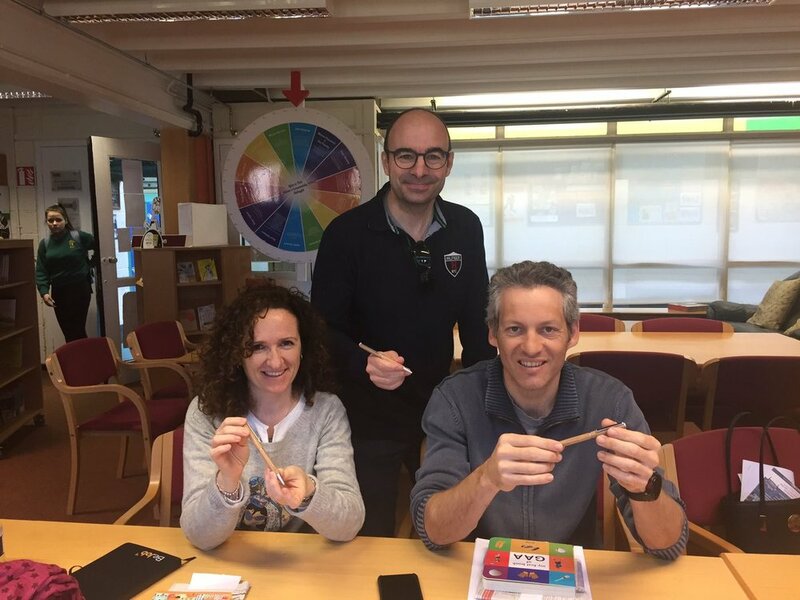 In October 2018 the inital planning meeting took place in Membrilla, Spain. 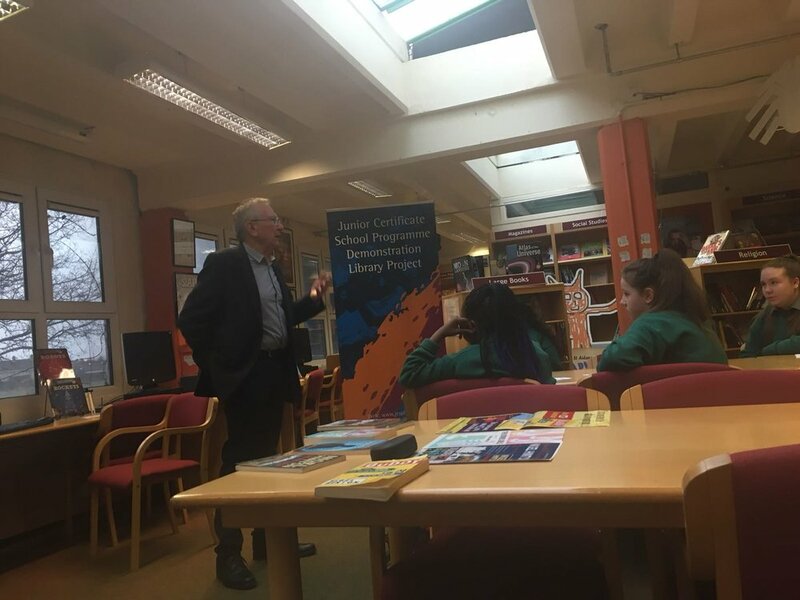 The meeting was attended by Ms. Flynn, St. Aidan's Librarian and Ms Mullaney, Killinarden Community School Librarian who linked up with teachers from the other schools to plan how the project will proceed. The trip to Spain was an amazing experience and we were warmly welcomed by our Spanish hosts who showed us around their beautiful and historical cities Toledo and Madrid and the students from IES Marmaria even performed a fantastic version of the classic 'Danny Boy' especially for us. The next steps in the project are to complete a number of tasks and activities in partnership with students in the other schools. For example, reading survey, logo design, literacy quiz and library and reading initiatives. The project will be very educational and will give St. Aidan's students a chance to learn more about their European neighbours. 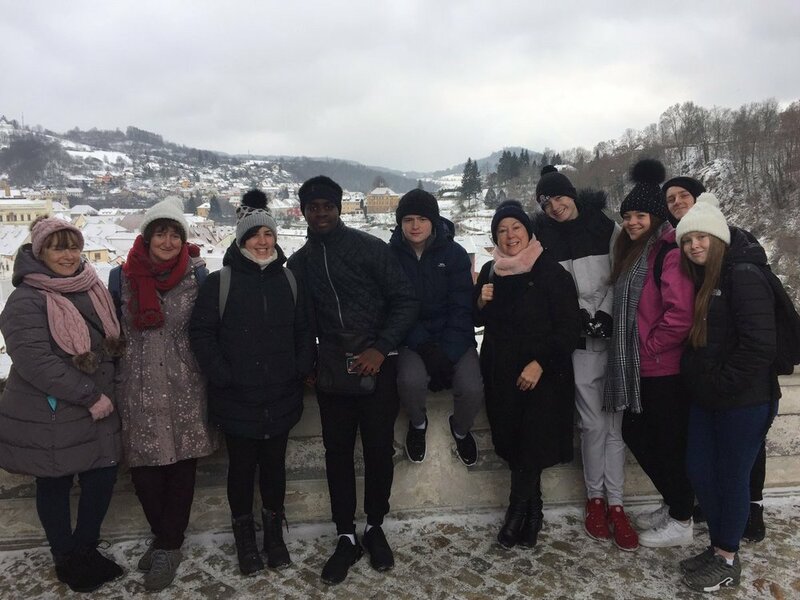 The next "Europe, A Heritage Made of Stories' trip will be to Obchodni Akademie in Pisek, Czech Republic and we will be taking some lucky students with us! 'Europe, A Heritage Made of Stories' is a fabulous project and we are very lucky to have been chosen to take part. You can learn more about the meeting in Spain by clicking through the slideshow below. October 26, 2018 by Martina Flynn. Congratulations to Natalie Thunder from last year sixth year who received the South Dublin County Council/Ittallaght Access Scholarship on Monday 22nd October, 2018. Everybody arrived to the school excited for sports day. The sun was shining and the temperature was just right. All the participants spread out to take part in their individual activities:- penalty shootout; tug of war; chess; table tennis; long kick; the sprint. I hope everybody enjoyed the sports day as much as I did and I would like to thank the PE teachers for organising a great day!! October 5, 2018 by Martina Flynn. 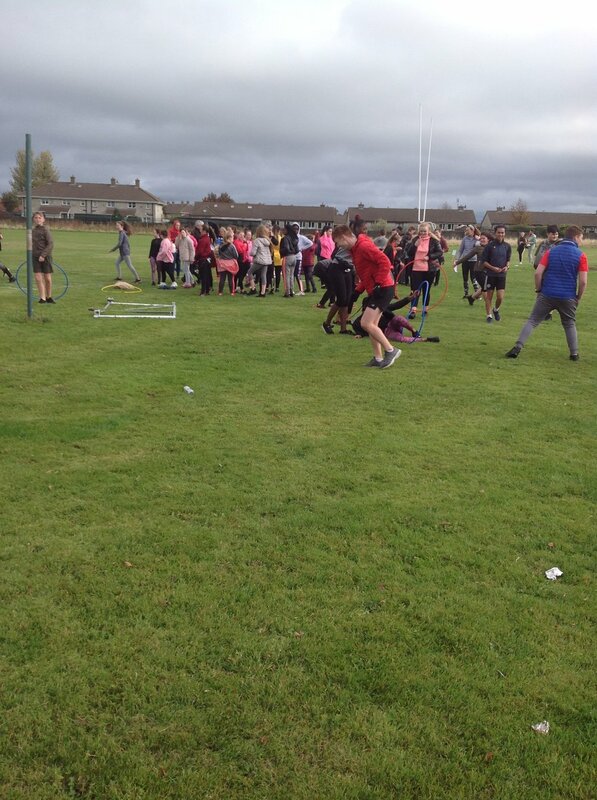 The match was played at Thomas Davis Pitches as part of The Tom Quinlan Plate 2018. 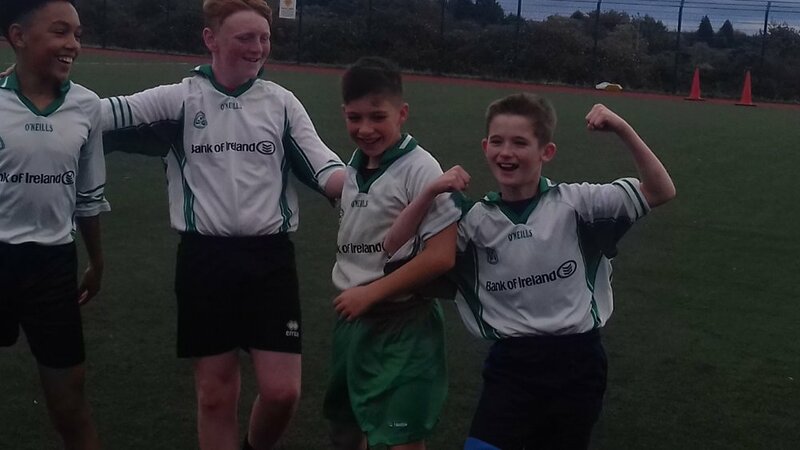 It was a very close match throughout, but Ballinteer managed the win. 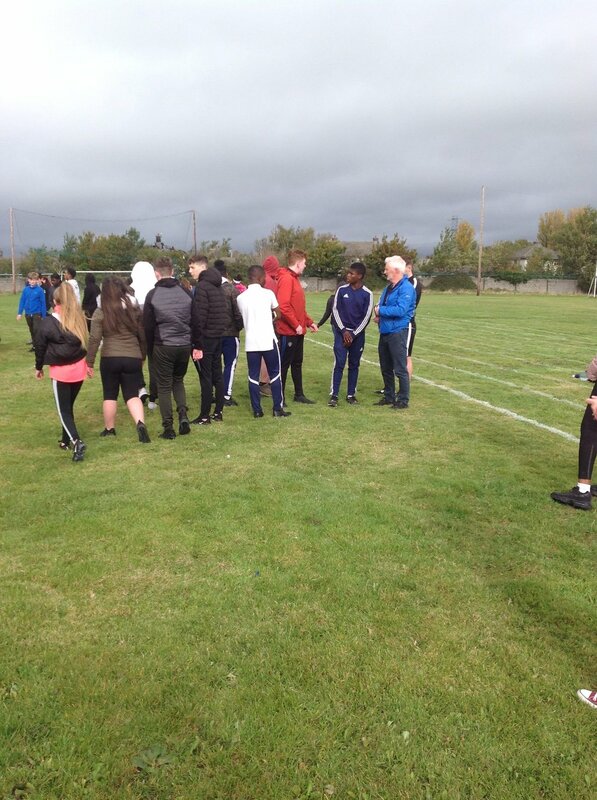 We gave a minutes silence to remember Kyle Finnegan. 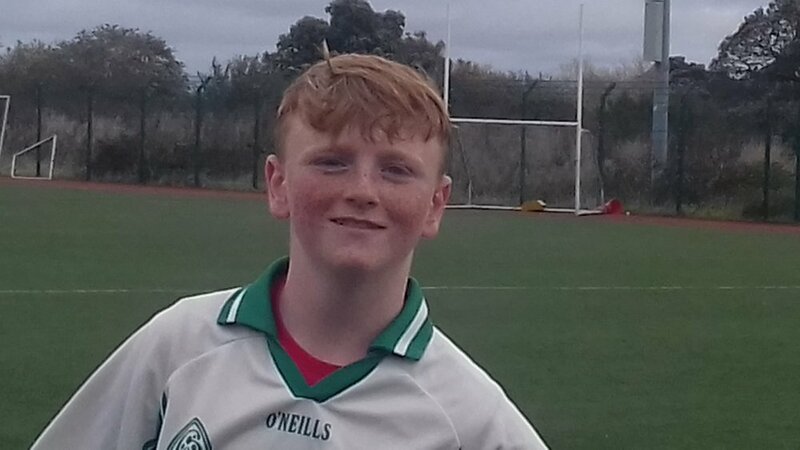 Special thanks to Charlie Howard & Kathleen McAleer for fantastic performances during the match. 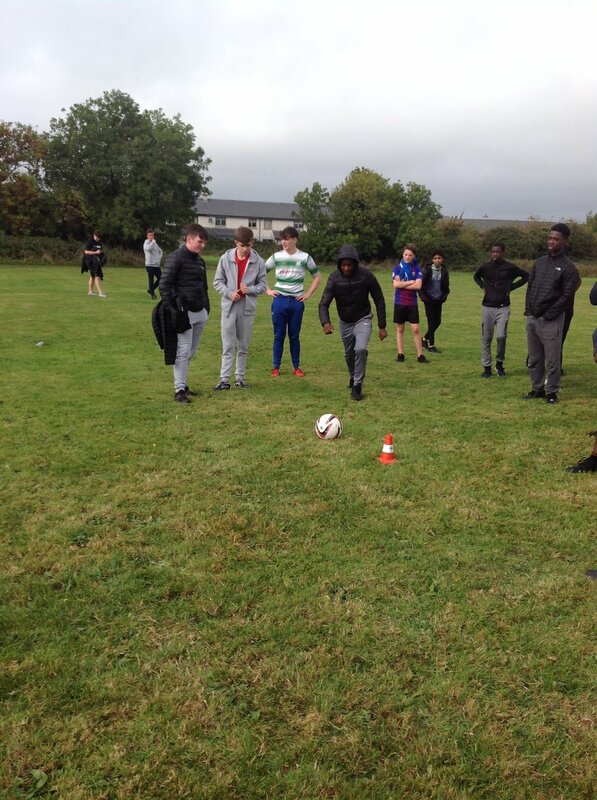 Also for two 5th year students Callum Lambert & Nathan Kavanagh for coming along and doing warm-ups with the 1st years. 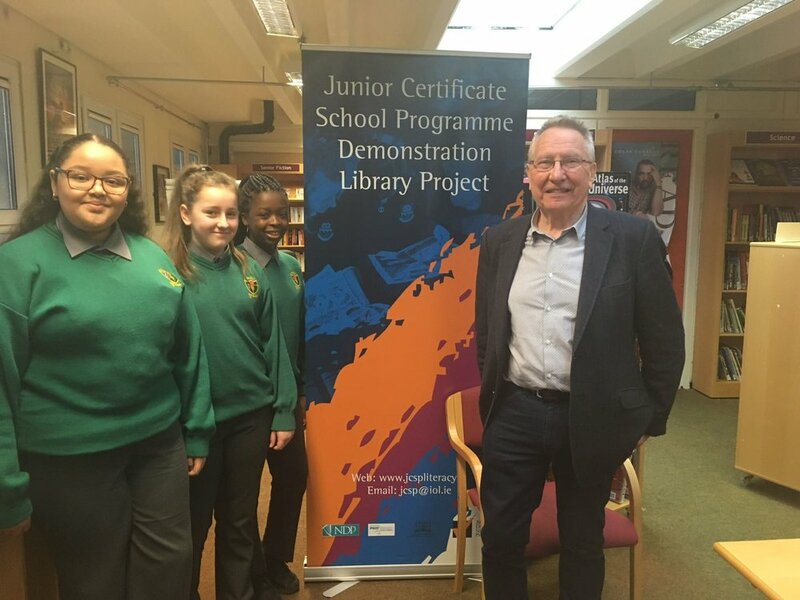 The Wellread National Award is an initiative run by the PDST to promote reading in schools. St. Aidan's applied for this award and we are delighted to announce that our school has been successful in becoming a Wellread School 2018-2021. This is a major achievement, enormous endorsement and a great honour. We are very proud! A lot of hard work by the students, parents, the Librarian Ms Flynn, teaching staff and management has lead to this. Below is our presentation which gives you a flavour of the work being done in our school to promote and improve reading. June 5, 2018 by Martina Flynn. St. Aidans Community School Chess Team 'Knights of the Board' were delighted to win Gold in the JCSP Mini Chess Tournament today with Killinarden Community School taking home Silver and Mount Seskin Community College Bronze. The students are looking forward to more Chess next year! May 16, 2018 by Martina Flynn. 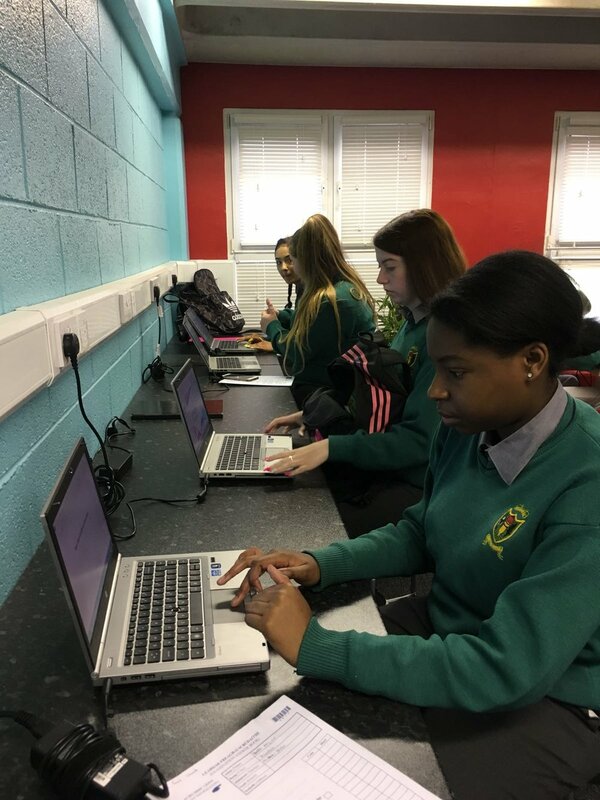 Miss Sheehan's second year Science group doing their Classroom Based Assessments for Junior Cert in the new Project Room. Well done to all the students! May 9, 2018 by Martina Flynn. 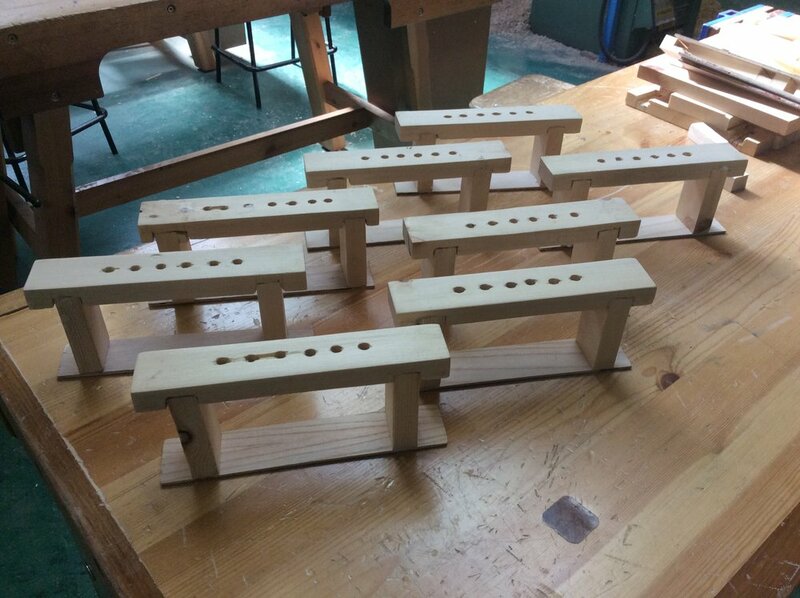 The first year Woodwork students putting the finishing touches to their pencil holders - well done! April 30, 2018 by Martina Flynn. 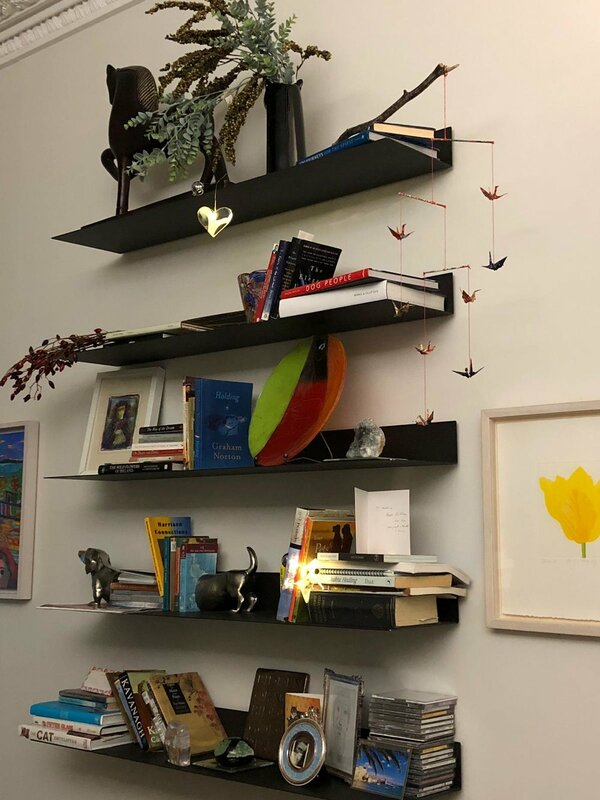 The students of St. Constance's and St. Elizabeth's recently exhibited their Art Projects in the Library and everyone was very impressed. Well done! April 27, 2018 by Martina Flynn. 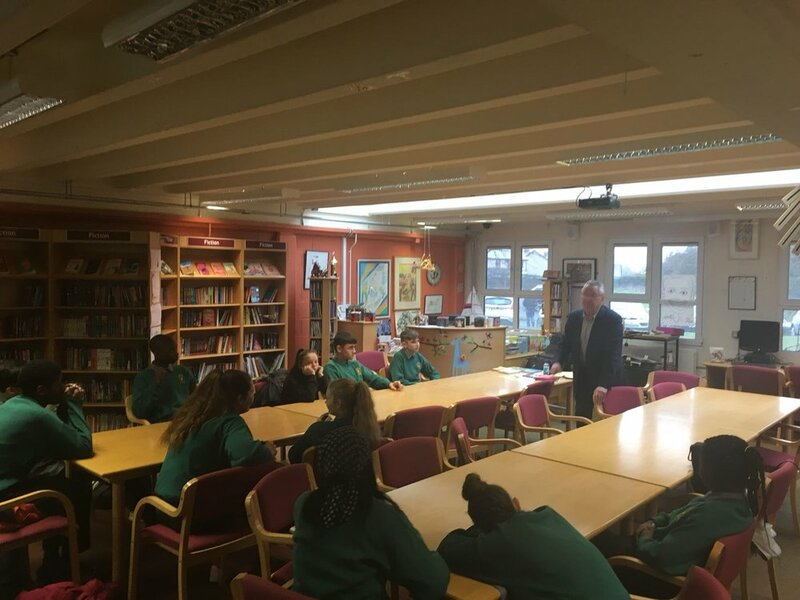 Just before Easter we visited to St. Kevins Community School in Crumlin to take part in a Chess Tournament organised by the Transition Year students. St. Aidans Chess Team were fantastic and made the school so proud. Michael Roche took Gold home to the school and Rilwan Gbadamosi took Siliver home, Beauford College took home Bronze and Gavin Ly our Chess Champion for 2017/2018 took home Copper. It was a fanastic day and we would like to say well done to all the students on the Chess Team. April 24, 2018 by Martina Flynn. 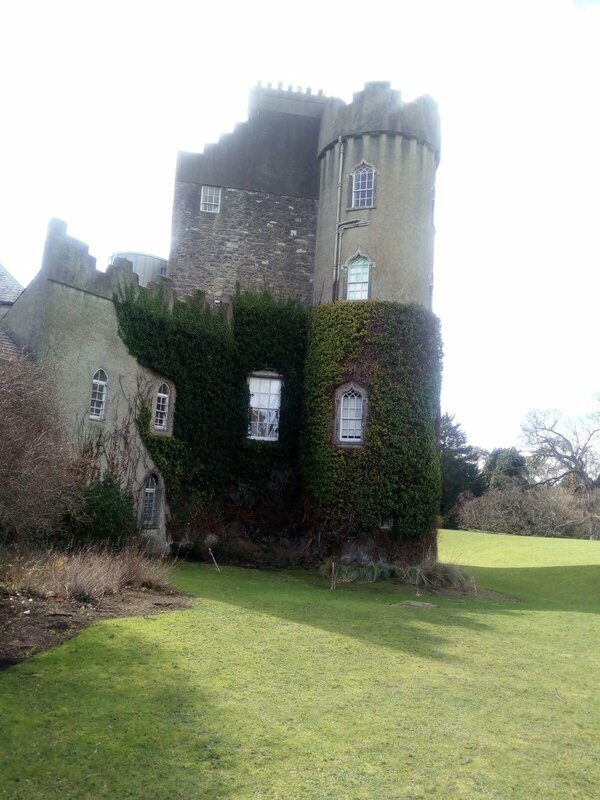 St. Aidans parents went on a Potholes trip to Malahide Castle on Tuesday, 13th March. The castle is surrounded by 268 acres of woodland, park and walled gardens. 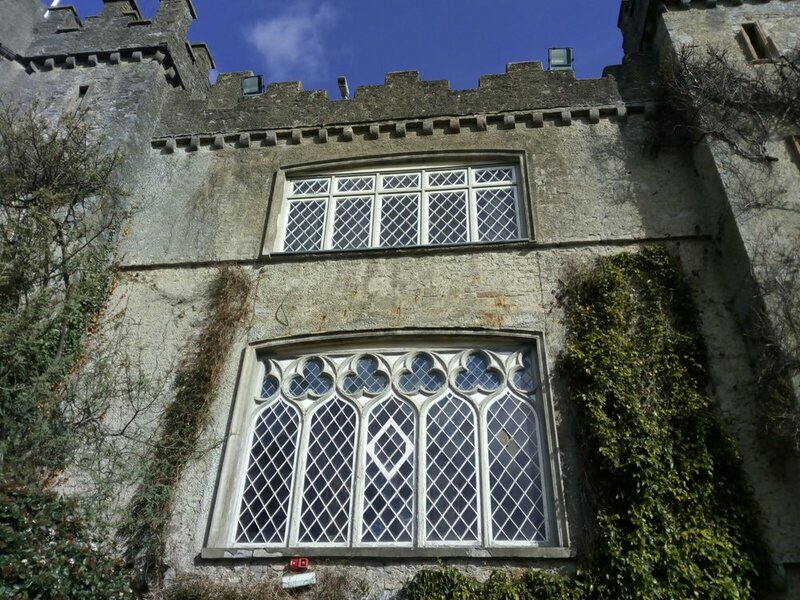 It was home to the Talbot family for nearly 800 years. The parents toured the castle, walked round the gardens and finished the day with well deserved tea and scones. Everyone had a fantastic day and are looking forward the next Potholes adventure. April 16, 2018 by Martina Flynn. 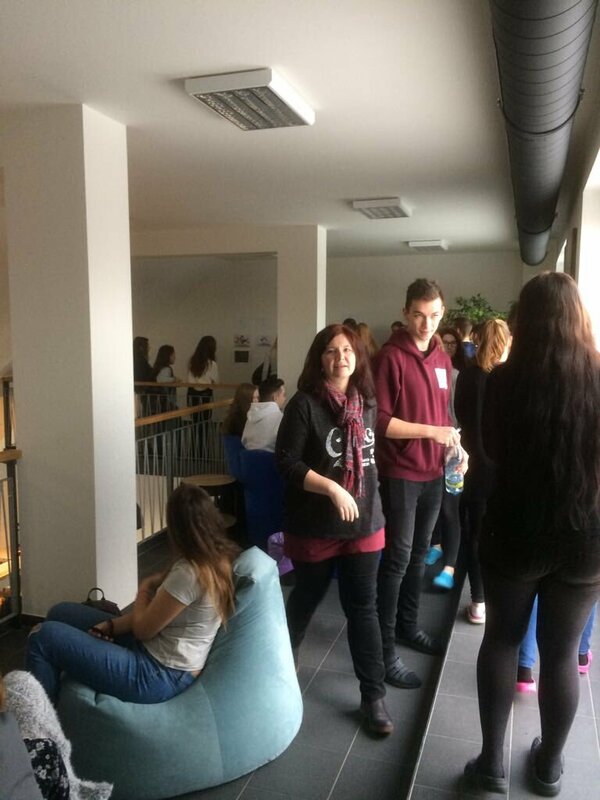 Seven secondary schools from South Dublin including St. Aidans Community School showed off their finished work at the end of a 12-week song production workshop (songwriting and recording). St. Aidans rap is called 'Bones' and its about being postive and not fearing the future. The students had a brilliant night and are looking forward to working with Suburban Sounds again! March 7, 2018 by Martina Flynn. Parents don't forget that you can check your child's progress online. Go to our website and click into the parents area. Choose the VSWARE tab which allows you to see your childs report, attendance and punctuality. Your login password was sent to you by text at the beginning of the academic year. If you need to update please call the office 01-4524677. More new features to follow so keep an eye on the parents area! January 30, 2018 by Martina Flynn. Just for Parents/Grandparents! Places limited book early. Click here to see a list of activities.